Six donkeys walk to the left in the same rythm and one donkey walks in the opposite direction. This donkey, however, does not disturb the total picture of steady rythm. The regularity of the body lines and the quiet walking movement work together to create a picture of strong unity which is typical in the work of this artist. Horses and other animals played a dominating role in the work of Franz Marc, whether or not in relation to humans. These donkeys show their strong personality. Usually donkeys are pictured in the service of man, but here they have been pictured in their own value. 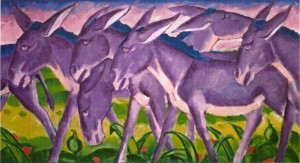 Franz Marc made this work after having seen a reproduction of an Egyptian limestone relief dating from about 2650 BC, which is in the Collection of the Museum of Antiquities in Leiden.